Starring Nandita Das and Subodh Maskara, Between the Lines is a thought provoking play that unearths the trials and the tribulations of marital life. It is set in contemporary India where educated and affluent couples are caught between modernity and the traditional world. Between the Lines peels, layer by layer, what is said and also what is often left unsaid in a couple's relationship. It raises many questions, answering a few and will leave you with some lingering thoughts and feelings. Tickets: Only silver tickets (Tk.2000) will be available at the venue, other tickets have been sold out. Time: 8 p.m. till 10 p.m. The weather is perfect for a dose of classic rock from Stone Free. The band returns to Roll Xpress Café with their rendition of rock tributes. On the menu -- Dire Straits, Eric Clapton, The Doors, The Eagles, The Beatles and many more. Limited Seating. Tickets: Tk.500; available at the Roll Xpress Cafe counter. A wild night is calling; come on over, sing along, dance and even roar with the Rusty Ramblers as they play rock, rhythm & blues -- Jimi Hendrix, Dire Straits, Queen, U2, Lenny Kravitz, the Beatles, Elvis, Ray Charles, James Brown et al. The Rusty Ramblers are: Nafeez Al Amin, Rahil Farhad, Sarfaraz Latifullah, Zahid Ahmed and Imran Rabbani. Ticket: Tk.1200, including buffet dinner. One of the world's best known literary festivals is coming to Dhaka! Arranged at the historic setting of the Bangla Academy premises, this is one event not to be missed. This year's festival will be a literary feast with panel discussions, recitations, book launches and more, featuring Vikram Seth, Syed Shamsul Haq, Nandita Das, Philip Hensher, Kamila Shamsie, Basharat Peer, Md Zafar Iqbal, Mohammed Hanif, Selina Hossain, Gillian Clarke, Kaiser Haq, Arundhathi Subramaniam, Sharbari Ahmed, Farah Ghuznavi, Shaheen Akhtar, Shehan Karunatilaka, Tahmima Anam, Catherine Masud, Wasfia Nazreen, Mahmud Rahman, Anisul Hoque, Audity Falguni, K Anis Ahmed and others. Entry is free. Pre-register online at hayfestival.org/dhaka, and tickets can be collected before the event or at the venue. Email: dhaka@hayfestival.com or contact 0171 1546 765; 0191 191 3012. Time: 5 p.m. till 10 p.m. This year 'Casa Murilo', an indie rock band from Norway is visiting Bangladesh to perform live as well as on TV shows, collaborate with local artists, conduct workshops and perform in school concerts. Time: 11 p.m. till 6 p.m. The British High Commission is hosting a StreetWise Art Exhibition where original artwork in various mediums -- pastels on recycled paper collage, wax on watercolour, and glass beads on paper, will be on exhibit. New Xmas Cards are to be launched and visitors can avail quality StreetWise stationery products at the venue. Time: 10 a.m. till 8.30 p.m. The concert is a fundraiser for providing medical aid to poor patients. The line-up comprises Ark, Different Touch, Feedback, L.R.B, Maqsood O Dhaka, Miles, Nagar Baul, Nova, Prometheus, Souls and Warfaze. Gate opens at 10 a.m., show starts at 11 a.m.
Organised by Carnival, the event is initiated by Aysha Memorial Specialized Hospital (Pvt.) Ltd.
Tickets: Tk.200, available at the venue before the show. One thing that Dhaka has in plenty is people with voracious appetites and the other thing that it has in plenty is countless restaurants to appease the humongous appetites of these people. Entertainment in the metropolis is very sparse and limited and the most accessible and easily available form of entertainment outside the house is eating out. Dhaka has it all starting from small canteens where you can get a shingara for 4 bucks to extremely premium places where water costs 100 bucks. Since there are so many of these that it is just too difficult to keep track of them all, a Facebook page started sprouting up on people's home pages and within a very short time it gathered quite a commendable fan base. With more than 15000 likes Dhaka Foodies is a much-visited Facebook page now. The owners of the page, who prefer to keep their anonymity in order to keep the mystery alive, noticed the fact that food reviews for the ease of everybody was very hard to come by. “Dhaka people have basically two things to do, eating out and Facebooking and when you combine the two you get Dhaka Foodies,” says one of the page owners. They wanted to create a platform where people could leave suggestions, ideas and reviews about where to eat and what to eat. They also wanted to popularise the culture of food critiquing which is very uncommon here. Initially they had a food review competition to make people ease up to the idea of writing food reviews for others on a social network to read. Many people post food reviews on the page with a number of regular contributors. This time around Dhaka Foodies organised their photography competition which went on for quite a while with people posting their attempts at food photography. “We believe food photography is something that people can take up, which is rarely seen here outside professional fields," the owner pitches in. Most of the participants were amateurs and most of the pictures taken were with smart phones and some with DSLRs. The photographs were judged by: Syed Zakir Hossain, former chief photojournalist of the Daily Sun, also former photojournalist of The Daily Star and Kaler Kantha; owner of Bengal Pix, Pallab Mohaimen, assistant editor of Phothom Alo IT and Lifestyle segment, a Big Foodie and a passionate photographer; and Hassan Bipul, assistant features editor of the leading Online News portal of the country, bdnews24.com and also working for Zeppelin Networks -- a French photo agency -- as their photographer for Bangladesh. “We judged the photographs on technical quality, which includes the composition, attractiveness and appeal of the photographs. But we were very impressed given the quality of these amateur photographs,” opined Syed Zakir Hossain. The competition concluded with an exhibition of the top 50 photographs displayed at the Dhaka Arts Centre for 3 days. The winning picture was a simple shot of mouth-watering sheek kababs, grilling away over burning coal while the second placed picture was that of a splash of orange from a glass of orange juice, caught at just the right moment. The top two winners of the competition, Farhan Ashik and Sibgat Alam, were awarded a Nokia Pureview 808 smart phone and a Lumix S3 camera respectively, while the rest got a certificate of appreciation besides the opportunity to take away framed versions of their photographs. The entire programme was pulled off by Dhaka Foodies with the help of Tron. Put the milk into a wide, heavy pan and bring to boil over high heat, stirring constantly. Now lower the heat and cook the milk, stirring constantly, until it has thickened and reduced to about ¼th cups. (This will take about 40-45 minutes). Stir the sides of the pan constantly to avoid scalding. Pour the mixture into kulfi moulds or small ramekins, distributing evenly. Cover with plastic wrap or foil and freeze until set. To serve, remove the ice-cream from the moulds by running a sharp knife around the edges of the pista kulfi. 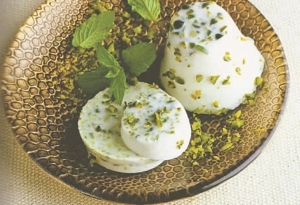 Slip each kulfi on to a dessert plate, cut across into 3-4 slices, and serve. A new addition to the list of eat-out places in the city is a cosy, French inspired, crepe cafe located in the heart of Dhaka, Gulshan. Free from the hubbub of the main road, the place is tucked away at the back end of a one-storied building, in a place that used to be a run down party hall. Crepe-au-Lait is the brainchild of four childhood friends who shared a strong passion for good food. 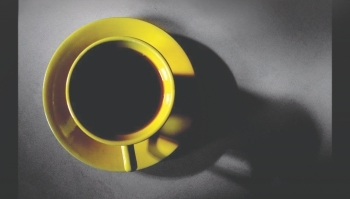 Shafquat Rahman, Faisal Zahir, Yousuf Aman and Tahrima Mustafa are the joint owners of the café. They loved to sample international cuisines while studying abroad and this eventually led to the idea of having their own café in Dhaka. Discovering that crepes were yet to be introduced to the food scene of Bangladesh, this seemed like the perfect starting point. The first thing that catches your attention once you enter the venue is the open patio with seating arrangements designed keeping winter in mind. Entering the café, you will be greeted with a warm, cosy, retro-chic setting, with walnut, oak and olive being the colour theme. The occasional splash of colours in the form of a tangerine couch or a magenta cushion adds to the playfulness of the environment. The interior boasts creativity and inspiration and has been designed from scratch by the four owners, taking no external help whatsoever. Hence, the atmosphere speaks of their minds and personalities. The sophisticated yet perky ambience depicts a place where like-minded people come together to lay back and exchange their thoughts and stories. To begin with, let us first get an idea on what a crepe is. It is a French delicacy that is a thinner, larger version of a pancake, made from a similar batter. What make crepes special are the fillings and condiments that go with them. Crepes can be both sweet and savoury, depending on the filling. Crepe-au-Lait offers almost thirty different kinds, both sweet and savoury. They also have something for vegetarians. Classic fillings include mushroom, chicken, beef, various kinds of cheeses, varieties of sauces and vegetables. I ordered a mushroom and chicken crepe from their menu which turned out to be quite a satisfier. The crepe was tender and moist, and the chunky stuffing of mushrooms and cheese was to die for, although the chicken was on the slightly drier end. Apart from their signature crepes, they also offer a range of drinks and desserts. Their frozen yoghurt ice cream is definitely a novel introduction and is known to be a healthy concoction. They also offer English breakfasts every weekend. The service is definitely top-notch and makes you feel at home. Future plans include rewarding their customers by introducing loyalty cards, building on brand loyalty by focusing on quality and eventually expanding to other parts of the city. 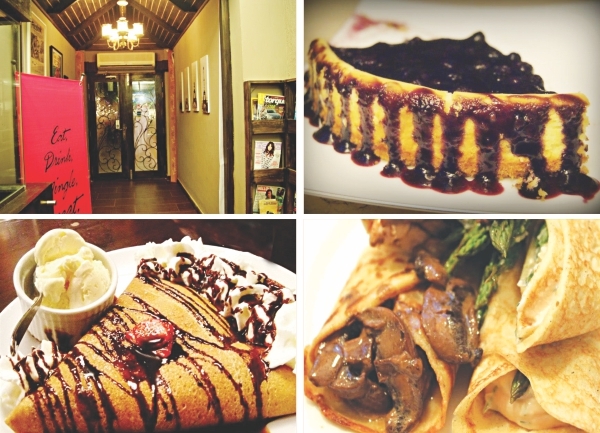 Crepe-au-Lait is located at House #11, Road #68, Gushan #2.